Whilst we operate all over Northamptonshire and beyond from our Wellingborough base, given the opportunity to travel a minor distance down the road, we’ll happily take it. 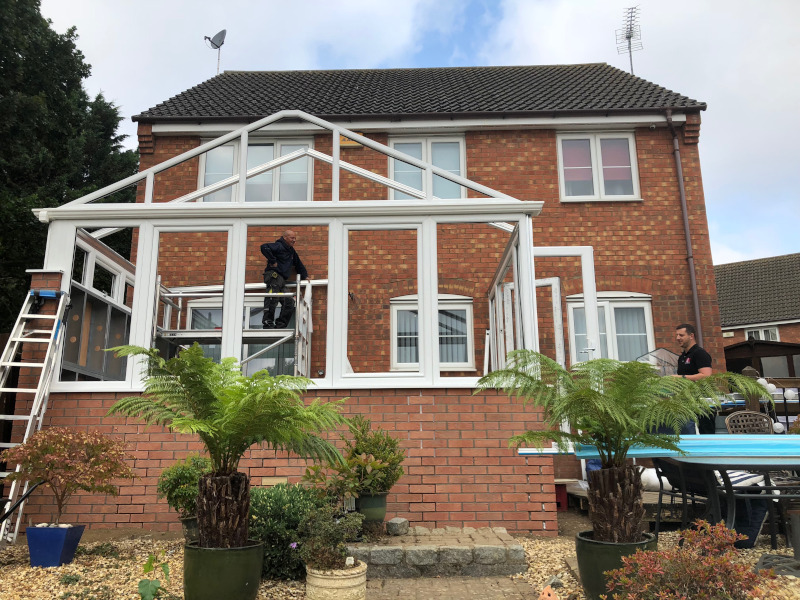 Recently, we took the short drive down to Irthlingborough, Northamptonshire for a conservatory installation. Mr & Mrs Hawkins required an extra room they could use as a space to enjoy a bit of peace and quiet. They were travelling to another showroom in the hope to find something suitable, however it was closed, so they headed to the T&K showroom instead. Whilst here, they chatted to our salesman, Dave, who informed them of our excellent installation record and high-quality conservatory products. 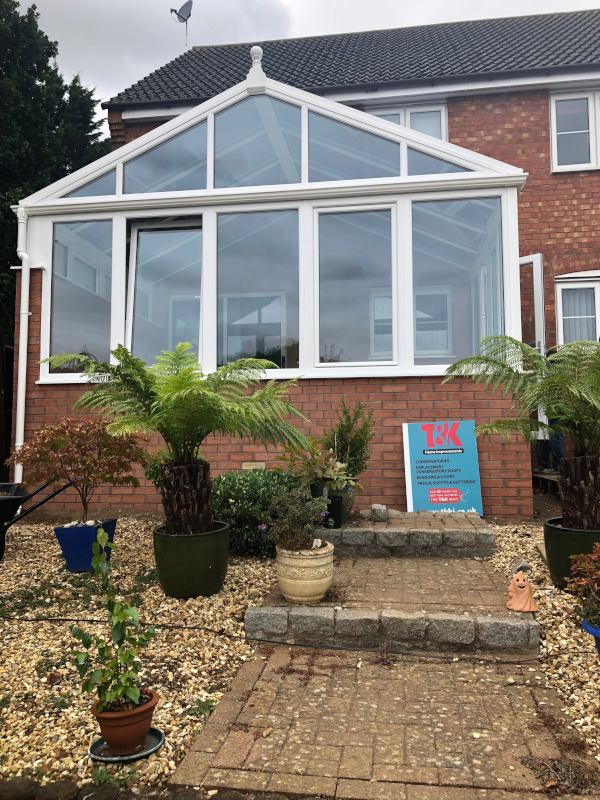 Seemingly delighted with Dave’s conduct, Mr & Mrs Hawkins said: ‘the salesman at T&K was so very helpful and reassuring.’ After speaking with Dave, the Hawkins family agreed upon a gable-ended conservatory for their home and a date for work to start was set. 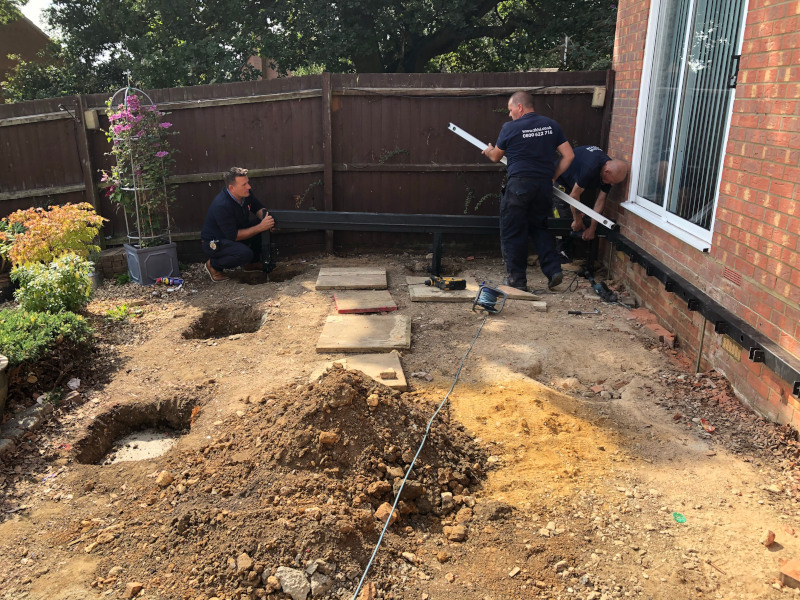 After arriving at the site, the installation team of Mick and Dave got to work straight away, digging out solid conservatory foundations for the new structure. Once the footings were dug out, we installed a Durabase plus base. This was chosen because it’s quick and easy to install and results in less waste, without sacrificing installation quality. This allowed us to severely limit the disruption caused to the Hawkins’ property. By day 3 we were fitting tilt & turn windows, providing the Hawkins with the option to clean their windows from the comfort of their own home. High-quality double glazing was fitted on each window, ensuring they were all thermally efficient, secure and reduced outside noise. An AMBI Ultra glass roof was chosen for the roof. This innovative system utilises tinted glass, ensuring for a more shaded conservatory environment. 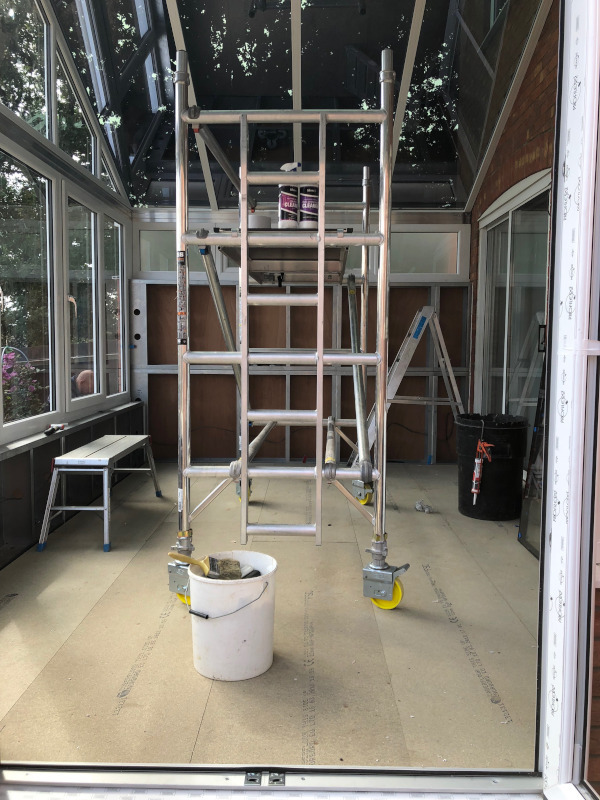 Because it reflects up to 91% more solar heat compared to untinted glass, it also ensured their new conservatory wouldn’t become too hot after prolonged sun exposure. This meant the Hawkins could enjoy their new conservatory in comfort as well as quiet. 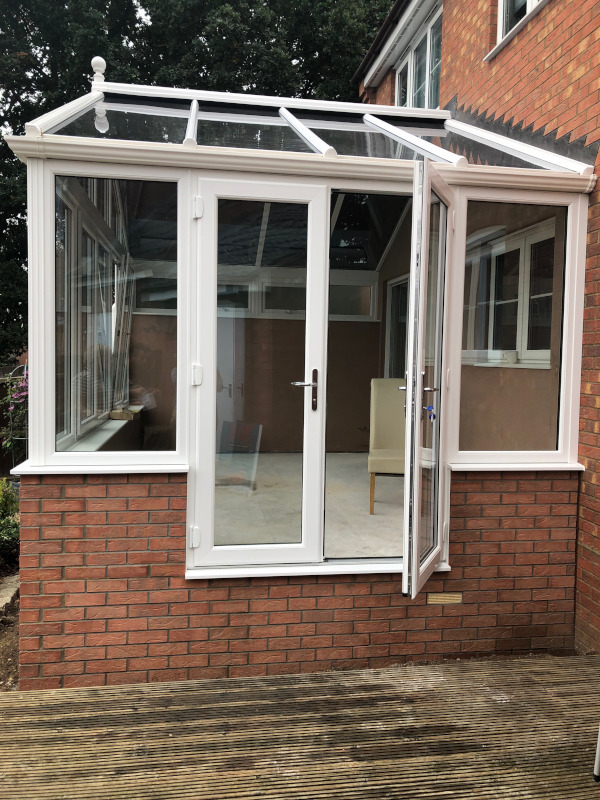 A set of stylish French doors were fitted, helping to accentuate the quaint charm of the structure whilst providing the Hawkins family with an easy way to transition to their garden or ventilate their home. The doors were fitted with a high-security SAC multi-point locking system, ensuring the security of their home wasn’t compromised either. 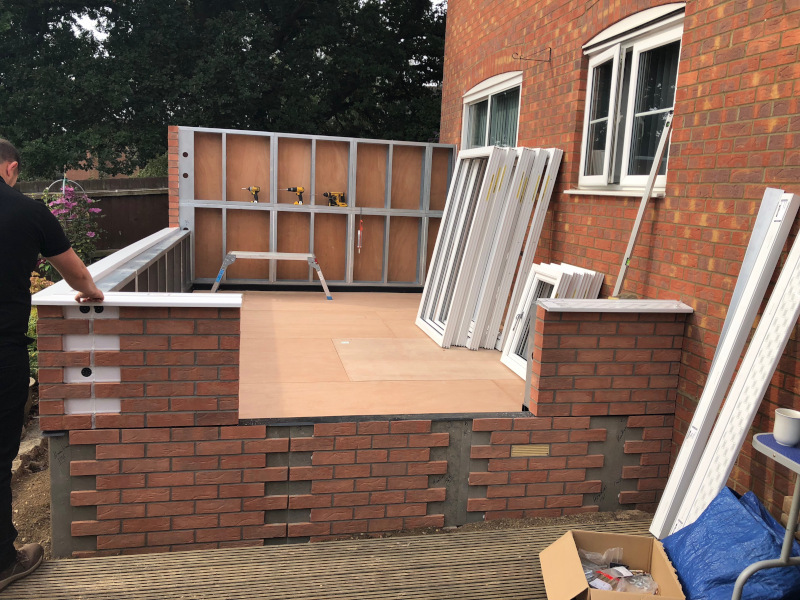 After just 5 days the job was complete, leaving Mr & Mrs Hawkins with a cool, comfortable and peaceful place to relax, which likely added considerable value to their property too. Have you been inspired by our work here? Get in touch with T&K today to see how we can help you improve your home. Call us free on 0800 622 716 or contact us online.